In 1980 Mount Saint Helens erupted, sending ash hundreds of miles in all directions. Now she rests radiating her majesty and beauty to all her surroundings. The sky draws you in with its blue hue and streaks of white clouds. The sky is made out of rose quartz with blue stain behind it highlighting the streaks of white within the rock itself. The quartz is cut causing the streaks to create a focal point that draws the viewer into the scene centering on the mountain. The fog below the mountain is made from agate which has a cloudy sheen. 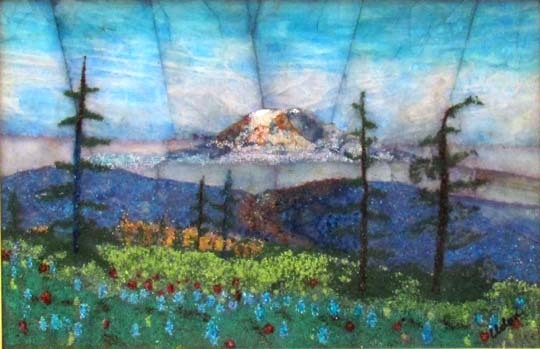 Small shards of colored rock are strategically placed throughout the scene to suggest trees and flowers.